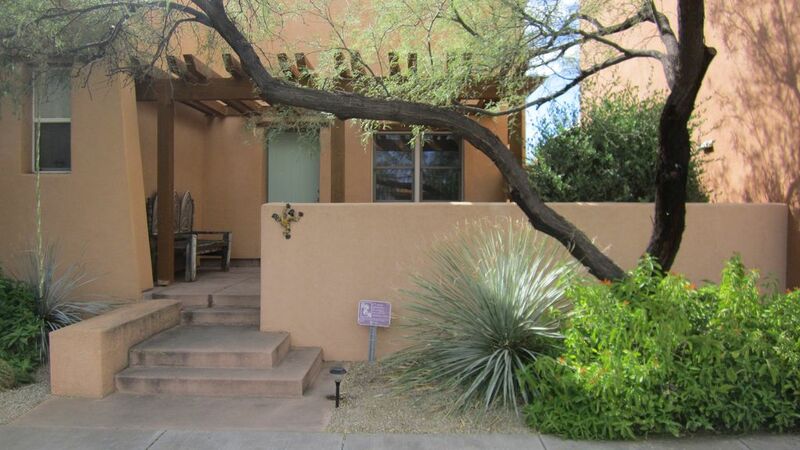 Enjoy the Sonoran Desert from this single story home in a peaceful, sustainably designed foothills community. The covered porch looks out to the Rincon Mountains & the bedrooms & living room look onto a private courtyard through sliding glass doors. The comfortable living room has a great entertainment center with surround sound & a gas fireplace. The master bedroom has a king-size bed, large private bath with walk-in shower & two closets. The second bedroom has a queen-size bed & plenty of closet space. A hidden office area with wireless high speed internet is located off the dining room. It's a five minute drive to Saguaro National Park East and the Fred Enke Public Golf Course. The Rincon and Catalina Mountains and riding stables are close by. Whats green? Our house has solar hot water & electric and native landscape with reclaimed irrigation. The Civano Community provides walking paths, a tennis court, two solar heated swimming pools & a friendly community. fitness center. The community center is within walking distance and has an eye doctor and a dentist, studios to take ballet, pottery and yoga classes, massage and a beauty salon. Swimming, tennis and walking trails are provided within the Civano Community. Horseback riding and golf are close by. Saguaro National Park offers wonderful hiking trails and wildlife viewing. Shopping, restaurants and cinemas are just a short drive.